This giveaway will end August 9th at Midnight EST. 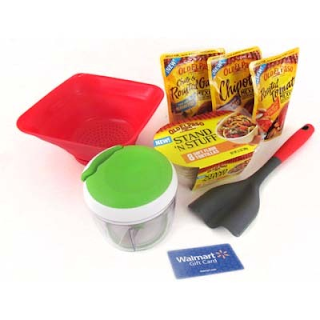 Disclaimer: I received a complimentary Old El Paso Taco Night Prize Pack & Walmart Gift Card for the purpose of writing a review and hosting a giveaway. Regardless, I only recommend products or services I use personally and/or believe will be a good fit for my readers. The views and opinions expressed on this blog are purely my own. Results may vary. No monetary compensation was received. I think I would like to try the Flank Steak Tacos with Mango Salsa. Sounds delicious and I think our whole Florida Family would love it! I'd like to try the Old El Paso® Stand ‘N Stuff® Soft Tortillas. I would fill them with ground beef and avocado. Thanks for the chance! My favorite thing about family dinners is being able to talk about our day and catch up on what's going on with everyone. I would love to try the thick and chunky salsa. It would be great on my chips. We all love to sit around the table and discuss what we did all day. I would like to try the Seven-Layer Bean Dip recipe. It would be great to set out with chips at a party. The Chicken Quesadillas sound like something I would so love to make. growing up we always ate dinner together. It was the time when we would be able to catch up with each other and the events of the day. I would like to try Mushroom and Onion Vegetarian Tacos recipe. This is perfect for some of my vegan friends to enjoy with us. My favorite thing about having dinner together as a family is to share our days and enjoy games together. I would like to try the Grilled Taco Spiced Chicken. I love finding new recipes that combine two of our favorites, tacos and chicken. Eating together at dinner time is a way to share your day and reconnect with family members. They all sound so yummy and love to make them all but the I would love to try the Quick Southwestern Corn Salsa recipe sounds really good! My favorite thing about having dinner as a family is that we get to share stories and make new memories together. The kids get silly! I would like to try the recipe for Skinny Citrus Shrimp Tacos. It has warm citrus shrimp, fresh cucumber salsa and Greek yogurt. The best part of family dinner is being together and talking about our day or what we plan to do. I would like to try the Seven-Layer Bean Dip recipe.. I know this would be a hit at my parties. id like to try the Beef Taco Rice Skillet recipe ... it would be picky- hubby approved ! The recipe for Tuna and Pepper Enchiladas sounds pretty good? I think we'd like that. Thanks! I think the 7 Layer bean dip would be a great crowd recipe. I think my favorite family dinner thing is touching base on everyone's day and laughing together. Flank Steak Tacos with Mango Salsa sounds wonderful! My favorite thing about eating dinner as a family is the sharing that goes on. I'd love to try the Taco Dip in a Jar. My family has a similar recipe but not as compact. Family dinners are the only time of the day when everyone is available to catch up and laugh about the mishaps of our day. I would love to try the burrito pot pies and the enchilada casserole. My favorite thing about having a family dinner together is spending the whole meal arguing about who has to clean up. It's all good natured arguing though. I'd love to make the taco bake. I have always loved it and it's something I can eat constantly. It has a great amount of kick and doesn't get soggy or to crispy. I'd love to do a crock pot taco meat dinner one night but we'll see. My favorite thing about having dinner as a family would have to be just sharing what our day was like. We all have good days and bad days, by sitting together for dinner we have each other's support and advice regarding any problems we may have. I also love it because it's the one time each day when it's just us, no phones, tv, internet or missing out on dinner. The Heat 'N Serve Products sound delicious and pretty fast and easy! Garlic Chili Chicken Tortilla Stuffers sounds amazing! I would like to try the Enchilada Bake Dinner Kit. Sounds delicious! My favorite thing about having dinner together as a family is enjoying each other's company and a good meal. I would like to try the recipe for the Old El Paso Crunchy Fish Tacos. We usually have beef tacos, I think this would be a nice change. My favorite thing about having dinner together with the family is to have us all together and discuss our days. They have so many great recipes to pick from. My fave is the grilled taco nachos. Yummy. I like the sounds of chicken taco tinga. Our family loves tacos as well. We love Mexican food here, but I don't like anything too spicy! I'd love to try my hand at making their Quick Southwestern Corn Salsa! I love having dinner together as a family, because it gives us time to de-stress from the outside world & heavy schedules! And since my kids both love tacos, taco night is the best...no complaints from anyone that they don't like the meal! I love old El Paso! Would love to try out their crunch fish taco recipe. Sounds good! I love having dinner with the family because its always fun and filled with laughter and great conversation. I want to try the Crunchy Fish Tacos recipe. it looks really good and easy to make. I would love to try the Beef Taco Rice Skillet recipe. I know everyone in my family would love it. I'd love to try the Skinny Citrus Shrimp Tacos, everyone loves shrimp in my family and tacos are just awesome! I'd like to try a Skinny Citrus Shrimp Tacos. I would love to try the mild cheese and salsa. That sounds like something my whole family would love! I would like to try the roasted garlic cooking sauce. It sounds great and would add a different taste to the normal mexican we make. I would like to try the Ground Turkey Tacos recipe. The avocado and pineapple may create a very good flavor! Skinny Citrus Shrimp Tacos sound yummy. I love all of the different recipes. I just want to try the stand n stuff taco shell, it just looks fun and easier to use. I would love to try the thick and chunky salsa. It sounds delicious and my kids are big salsa fans! Though many of the recipes look great, I don't think it gets any better than simple, classic hamburger tacos. I love Mexican food more than anything else in the world. Tacos, tortas, huaraches, sopes, gorditas, beans. The recipe I would like to try is the Cilantro Lime Rice. I like Mexican night at home. We can make it as hot or mild as we like it. I would like to try the soft taco kit. I would try the Scoop-It-Up Taco Dip recipe. It sounds really easy and good. Seasoned ground beef, sharp cheddar, tomatoes, onions, sour cream, black olives, guacamole and romaine lettuce. I would love to try the Chipolte cooking sauce! Sounds very tasty. Will have to look for it next time I am at the store. I would love to try the tamale cups they looks so easy to make and I am sure they are delicious.. I would love to try the Margarita cake! My favorite thing about having dinner with the family is that we talk about our day and how it went. Flank Steak Tacos with Mango Salsa. I would love this with soft tortillas and Flank Steak is my favorite cut of steaks, so juicy! My favorite thing about Family Dinner night is everyone being at the table to talk! The problem is that the kids are 4 and 6... so the discussions are strange! I love the actual face time of family dinners together with no electronics and no distractions. We loooove taco night! I would like to try the Seven-Layer Bean Dip recipe. It would be great to fix for a card party. I would like to try the Scoop-It-Up Taco Dip I think it would be great for the few shells that get broken since the recipe calls for shells to be broken up. love to make them all but the I would love to try the Quick Southwestern Corn Salsa recipe sounds really good! Eatting together as a family was always our favorite time because we got to bond with our children and find out what was going on in their day. The recipe I would most like to try is the mushroom and onion vegetarian tacos. They sound wonderful! My favorite thing about having dinner together with the family is being able to spend quality time together and keep up with what is going on in everyone's life. 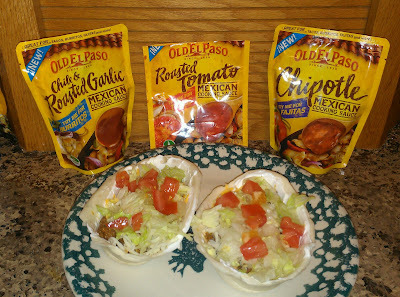 I really want to try the Old El Paso® Stand ‘N Stuff® Soft Tortillas. I love to try new products and these look like they would be fun to eat. My favorite thing about having dinner with my family is that we don't do it very often. Someone always has to be somewhere. So it's a real treat when we get together and can discuss our days/week! I love the Old El Paso taco seasoning mixes. I would really like to try the low sodium version. I'd like to try Grilled Taco Spiced Chicken. I would like to try the hot and spicy seasoning mix. It sounds really good. My favorite thing about family dinners is being able to catch up with everyone. It's nice to have a relaxed dinner and not be in a rush. I would like to try the hot and spicy seasoning mix. My guys like super hot food and would probably add hot sauce too! my favorite thing about family taco night is sitting down and eating with my family. We always get to catch up with each other after a busy week! I would like to cook the Fried Mushroom and Cheese Flantas. we being able to eat as a family an enjoying everyone telling what happended to them thru the day.